Shore fishing in Malta is popular, and can be fun, however local fishing needs local techniques. Read along so that when you hit our shores, you can look like a pro! We shall be seeing three different techniques in this guide, all targetting various species of fish. The most popular locally is Pole fishing. Spinning is also gaining ground and finally bottom fishing from the shore can also produce results. Pole Fishing is the most popular amongst the locals. Prepare a 4 metre or 5 metre extendible pole rod, available locally from a number of fishing outlets. For clarity's sake, these are the rods that do not take a reel on them. Plain fibre rods which open up from around 1 metre in length to between 4 or 5 metres. You could fish with something longer such a 6 metre, but don't try if you're not experienced. Rig the rod with a 0.18mm line which can take at least 0.5kg. A stronger line of the same diameter would be better. The length of the line should be exactly the length of the rod. You can also use FluoroCarbon lines. At the end of the line use a size 12 or size 14 hook. You can also buy what is locally known as a zewg (double, pronounced sewch), which would be a rig having 2 hooks horizontally spaced across a thicker line to fish 2 hooks at the same time. Fit a float on the line, a simple float, maybe 3cm in height and 2 or 3 cm diameter. Then attach 2 or 3 grammes of lead to the bottom end of the line, 15 to 20 cm above the hook/s. Bait Take some white french toast with you. When you arrive, first thing you do is to wet the bread and work it out in your hands until it looks like dough. At the same time, also prepare a small chum bucket. Throw inside scraps of bread mixed with water and possibly some shrimps for the smell. Locals use varieties of cheese patees to attract fish, the better ones are usually not for sale, but you can find some patees to mix with your chum at local fishing shops. Also take some shrimps with you (You can buy shrimps from any fish shop by the kilo, 200 grammes will be more than enough for a half day fishing). To bait shrimp, remove the hard shell and head and cut it up in 3 or 4 pieces. Location and Weather. When the sea is too calm, results will not be so good. The best is when the waves make some white foam, but should not be too windy either, otherwise you will not enjoy it. A force 3 to 4 wind should be perfect. Look for any place on the rocks which is around 1 metre deep at the rock edge, deepening to at least 3 or 4 metres a couple of metres out. Any place around the Island is good. You can fish from the shore in most tourist areas, including Bugibba, Mellieha, Msida & Sliema. For Pole Fishing, I personally prefer inhabited areas and harbours. Fishing Tecnhique. When you choose your spot, start attracting the fish with your chum bucket. Sit down, don't stand up, otherwise fish can see you. Try various depths by moving your float up and down. Usually you should fish around 1 meter deep. Cover your one or two hooks with the ball of dough you prepared and throw in. 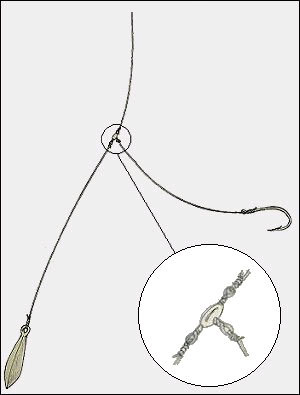 The hook should be completely covered with the dough, however the ball should not be much bigger than the minimum you need to cover the hook. With this fishing technique you can catch Mullet, Salema, Bogue, Bream and a variety of other fish staying close to shore. You can also experiment with other bait such as Cheddar Cheese or Worms (Locally known as Hniex). The best time for shore fishing is early morning until around 10:00am. If bread is not productive, try deepening your rig and have a go with worms or shrimps. Spinning has picked up in popularity during the last few years. Compared to pole fishing, the quantity of fish caught is much, much less. However both satisfaction and also size are much bigger! I will not elaborate on spinning techniques in this manual as spinning in Malta is like spinning any where else in the world. What you need to know are the type of fish which you can catch, where and when. Barracuda (MT - Lizz) can be caught all year round in Malta. The best places are harbour areas where shoal fish are present. Marfa, Xemxija, Cirkewwa, Valletta/Msida Harbour are all proven locations. The best time for barracuda is very early in the morning, however I have caught them even during the night with spinning. Dolphin Fish (MT - Lampuki) can be caught from the shore from late September to end of January. 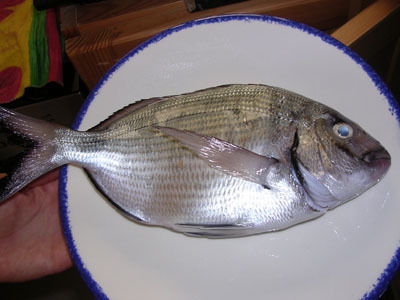 There are very few locations where you can catch Lampuki from the shore, and catching one is surely a big prize. The only places I know of are Blata Tal-Melh in Bahrija (Which is rather tricky to reach, but possible), Qbajjar in Gozo, Ghar Lapsi in Siggiewi and Cliffs below Wied iz-Zurrieq. Lampuki from the shore can only be caught were the sea is deep very close to the edge. Amberjack, Dentex and Mediterranean Trevally are feeding along our shores all year long. I have never personally caught any of these on spinning, but I know who has. The cliffs on the west coast would be your best bet. There are not many locations where you can spin from the cliffs, and as I pointed oout earlier, one of the best spots for spinning is Blata Tal-Melh in Bahrija. Harbour Spinning can be productive all year round. Look around in Msida and Valletta Harbours for any locals spinning. Various Pelagic fish can also be caught with spinning between October and December. For Pelagic Fish, deep areas in harbours or remote locations such as Blata tal-Melh or Qbajjar in Gozo would be your best options. 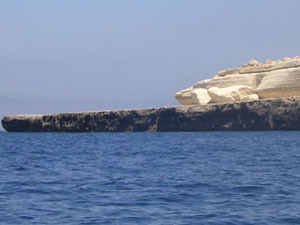 Bottom fishing from shore is also very popular in Malta. You can target a wide variety of Mediterranean species with this technique, however most of your fish will be quite small in size. Never the less, it is a good pass time, and you might be lucky and get a few fish which you can keep. The most common fish caught on bottom fishing are bream (Gilthead Bream, Sheephead Bream, Saddled Bream, White Bream, Annular Bream, Black Bream and Two Bandied Bream), Painted Comber, Dentex, Wrasse, Moray eels, Pandora, Bouge and many more. The top bait for bottom fishing are shrimps which you can buy from all fish shops, rag worms which you can buy from fishing tackle shops, and Cray Fish, also available from fishing tackle shops. Another vey popular bait is "Hniex ta l-Imperjal" which is also good for night fishing. This is however quite expensive and you can pay up to 40 euro for one worm, which will last you and your buddy for a whole night of fishing. Rig a pater noster (as illustrated) on a reel rod, typically equipped with .30mm line. I like to use size 7 hooks for bottom fishing, and 2 or 3 hooks is better than 1. From the weight to the first hook leave around 20 cm, and leave another 20cm between each hook. For bottom fishing, I prefer to look for remote areas, but if you wish, you can also try bottom fishing in inhabited and tourist areas. The worst thing with bottom fishing is your weight getting stuck on rocks at the bottom. There is nothing much you can do about this, but if you are in an area where your weight is getting stuck too often, change place. For the more experienced, Cliff Bottom fishing is probably the most productive. However to find good locations, you need to be adventerous. 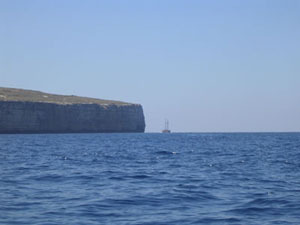 All the west coast of Malta offers great locations for Cliff Bottom Fishing.